"Every Olympics we dream of hearing the anthem and seeing the flag. It's the top," says Gal Fridman. Before Fridman's gold medal, Israel had won only two bronze and one silver. "I was feeling very proud and so happy to hear the people singing it." Fridman won a bronze medal at the Atlanta 1996 Summer Olympics, and a gold medal at the Athens 2004 Summer Olympics. In 1952, Israel first entered the games, but its Olympic history holds more terrorist attacks than by medals won and sport achievements. The Munich games in 1972, Palestinian terrorists killed eleven coaches and athletes. Taking Israel's first gold medal, Israeli President Moshe Katsav and Prime Minister Ariel Sharon invited Fridman for a visit and congratulations. Though Fridman, his first name, Gal, means "wave" in Hebrew, has been sailing since he was seven years old, entered his first competition when he was eleven and in the 1996 Olympics in Atlanta, won a bronze medal, it was still hard for his family to believe his gold medal, "It's very, very hard to believe that he succeeded in doing this," said Uri Fridman, Gal's father and first coach who watched his son race from his home in central Israel. 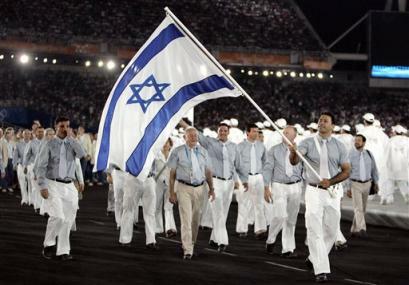 But now, in the 2008 Beijing Olympics, can Israel keep hope alive for another historic gold medal? Shahar Tzuberi, Israel's hopeful, leads the windsurfing competition, finishing first and third in the third and fourth races, respectively. There are still six more races until the medal race on August 20, and Tzuberi still has some work to do before he can match Gal Fridman's achievement from the Athens Games.